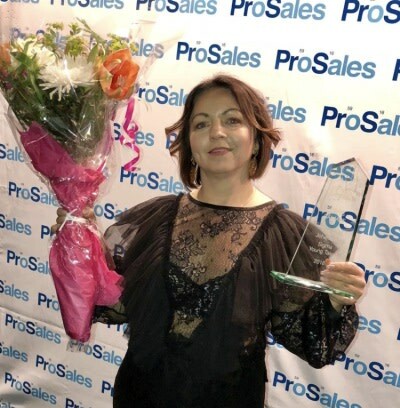 Pernilla Johansson won the award "Sales Representative of the year in B2B 2018" last week at the Sales Award Gala in Stockholm. – It's very honorable and I'm super happy. It is absolutely amazing to be part of his journey with Sigma Young Talent. Three years ago we started from nothing and today we have 200 graduated academics in IT and R&D as our employees. This award is a proof that our offering of programs for new IT talents is quite right in time. Together with our customers we want to create a better tomorrow and what can be better than working with talents in the beginning of their careers, says the winner Pernilla Johansson. The jury’s motivation for the award is: The winner in the category is not only a remarkable seller. She is also an entrepreneur and business developer in everything she does. Through great passion, excellent customer responsiveness and ability to customise programs based on customers' unique needs, she has succeeded in building up a whole new business within Sigma. This year's winner is a brilliant example of a salesperson who thinks new and goes the extra mile to create value for both customers and employees. The competition is arranged in different categories by ProSales and is awarded at the sales Conference Sales Award Gala. The purpose of the category Sales Representative of the year in B2B is to highlight a sales representative who can act as an example and inspiration on how to conduct modern sales work in a profession during an ongoing change. The sales Conference is the Nordic region's largest event and meeting place for B2B managers who want to understand and create the future of sales and marketing. Pernilla Johansson "Sales Representative of the year in B2B 2018". From the motivation: Through great passion, excellent customer responsiveness and ability to tailor programs based on customers' unique needs, she has managed to build a whole new business within Sigma.